In November 1917, thirty-three individuals in the Washington, DC area pledged their support to form a new church in Cleveland Park. 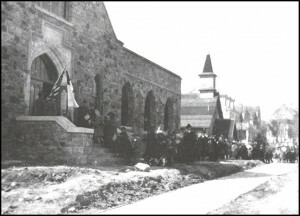 In March 1918, the first Sunday morning worship service was held in a temporary church building on the site of 34th and Lowell Streets. This new church called its first permanent pastor in May 1918. Click here to read How We Got Started, a history of the early years of the church by Richard Bambach. 100 years later, the Cleveland Park Congregational United Church of Christ is celebrating a century of common commitment to our mission of nurturing love of God and love of neighbor in the world. Please see the calendar below and join is in celebrating our 100th anniversary. You can also join us in celebrating from afar by sending memories, stories or photos to 100th Anniversary Task Force Chair, Jennifer Singleterry at jsingleterry@gmail.com. 10:30 am: Sunday worship service commemorating the 100th anniversary of the charter establishing Cleveland Park Congregational Church (CPC). Elements of the worship service will focus on church history and the year 1917. Attendees are welcomed and encouraged to wear period costume or bring personal artifacts from the 1910’s. Coffee hour will feature a “museum table” with church artifacts from the 1910’s. 12:30 pm: Coffee hour conversation – Richard Bambach will give a lecture and slideshow, and answer questions about the founding of our church and his research on church history. 10:30 am: Sunday worship service commemorating the history of CPC in the 1920’s and 1930’s. Elements of the worship service will focus on church history and the 20’s and 30’s decades. Attendees are welcomed and encouraged to wear period costume or bring personal artifacts from these decades. Coffee hour will feature a “museum table” with church artifacts from the time period. Evening, TBA: Choose your favorite recipe or dish to bring from decades past and join us for a potluck featuring food throughout our church’s history. Period costume encouraged. Pre- or post-dinner entertainment to be announced. 10:30 am: Sunday worship service commemorating the 100th anniversary of the first worship service held at CPC. Will feature original music written for our CPC anniversary. Coffee hour will feature a “museum table with church artifacts from the first years of the church. 10:30 am: Sunday worship service commemorating the history of CPC in the 1940’s and 1950’s. Elements of the worship service will focus on church history and the 40’s and 50’s decades. Attendees are welcomed and encouraged to wear period costume or bring personal artifacts from these decades. Coffee hour will feature a “museum table” with church artifacts from the time period. 12:30 pm: Potluck lunch and oral history event – come share food, memories and stories about our church. What is your favorite memory at CPC? Come share your favorite stories. 10:30 am: Sunday worship service commemorating the history of CPC in the 1960’s and 1970’s. Elements of the worship service will focus on church history and the 60’s and 70’s decades. Attendees are welcomed and encouraged to wear period costume or bring personal artifacts from these decades. Coffee hour will feature a “museum table” with church artifacts from the time period. 10:30 am: Sunday worship service commemorating the history of CPC in the 1980’s and 1990’s. Elements of the worship service will focus on church history and the 80’s and 90’s decades. Attendees are welcomed and encouraged to wear period costume or bring personal artifacts from these decades. Coffee hour will feature a “museum table” with church artifacts from the time period. Stay tuned for more information about this event, which will focus on homecoming for all children, adults and staff who were once involved in our church. Whether you join us in body or spirit, we hope you will “come home” to help us wrap up our 100th anniversary celebrations. A specific date and more information about this event will be announced. After we have celebrated our 100th anniversary year, the anniversary task force will compile a booklet of church history – including photos and information from our celebrations in 2017/2018. Booklets will be available for purchase. More details will be announced.